I'm surprised that M is not listed here. Well, for M I guess the first name that comes to mind is Mr. Coffee. Mr. Coffee is known for its reliability and affordability. 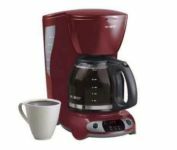 Check out the Mr. Coffee TFX26 12-Cup Coffee Maker. Very low price (in the $30 range) for a decent 12 cup machine. Comes with an automatic timer for those of us who want a fresh cup of coffee after getting out of bed. Join in and write your own page! It's easy to do. How? Simply click here to return to Coffee maker review.